There are a hundred little things about my husband that I’m thankful for each day. From his patience with the kids during bath time to his enviable laundry skills, I’m constantly reminded of why I love him. While we both say “I love you” on a daily basis, we rarely expound on the reasons why. Annual birthday and anniversary cards are about it. I know both of us would be thrilled to receive a handwritten letter from the other identifying all the reasons we’re still so happy to be a part of this marriage. 2. Do something they love. My husband and I have divergent interests. He loves playing golf and watching futuristic TV shows, and I love spending time in the kitchen and watching cheesy dramas. Shock your spouse this year by planning a day dedicated to something he or she loves! 3. Give the gift of alone time. I love my husband. I love our children. But from the time I was young, I’ve occasionally needed time alone to recharge. I’d guess that many parents are the same way. As much I love being with the ones I love, sometimes it’s necessary to have a break from questions and diapers and being “on”. I never want or need much time to myself; I usually only last a few hours before I begin to miss the noise and the sloppy kisses. This Valentine’s Day, giving the gift of alone time can be a thoughtful no-cost or low-cost gift. Consider allowing your spouse to get out and about alone, or maybe with a friend. A few hours sipping fancy coffee or browsing a favorite store might be the perfect gift. Or, if possible, take the kids out or to visit family while the other parent hangs at home, napping or catching up on a favorite show. 4. Take a walk down memory lane. If your relationship is anything like mine, it has evolved over the years. The new and exciting affection of the early years has been replaced by a deep, steady love born out of confronting the raw realities of life together. That transition is natural and necessary. I wouldn’t trade the lessons we’ve learned or the way we’ve grown with each other for anything, but it’s easy to get caught up in the details of day-to-day life. Sometimes it’s nice to remember the people we were when we fell in love nearly ten years ago (or more!) This February 14, dig out those old photo albums and love notes. Remind yourselves of the reasons you fell in love. 5. Prepare a special meal. Tastes and smells have the power to take us back in time the same way sights and sounds do. Think back over the course of your relationship, particularly the beginning, and focus on the meals you enjoyed together. What stands out in your mind? Maybe it’s the cuisine you enjoyed on your first date, or the first time he made you breakfast in bed. For dinner on Valentine’s Day, recreate that special meal in your own kitchen. 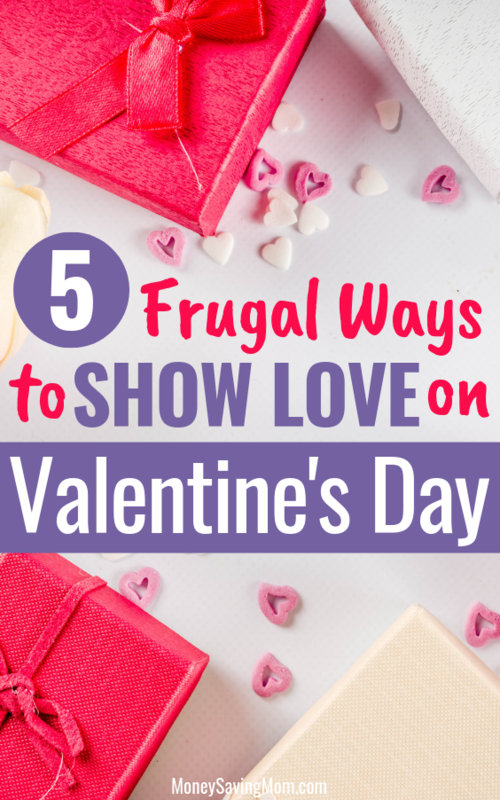 What are your favorite frugal ways to show your love? Abby is the wife of a patient man, mom to their two baby bears, and teacher of some cool kids. She loves dark chocolate and pretty napkins; the kitchen is her happy place. She lives in Mississippi and blogs at Winstead Wandering, where she shares the wandering thoughts of one who is not lost. What a great video, thanks for posting. As an empty nester, I can attest that childhood goes by in an eyeblink. It’s a precious time for sure. Not necessarily frugal, but special…. As my sister and I entered our pre-teens and teens, my dad would give each of us a single rose for Valentine’s Day (my mother received a bouquet of flowers). It made me feel loved and special to receive a rose from my dad when I was young. My stepdad used to buy me a yellow rose when he brought home flowers for my mom and it was always so special to me! For my kids, who are very young, I set a budget of $10 total. While they were asleep tonight I decorated their room with paper hearts I cut out and store bought strung hearts for their door. They each get a new low cost bath toy and one little goodie. We made them each a love note too. For my husband we set a small budget for each other and I got him a chocolate bar and made him a basket with all the ingredients to make bacon maple baked doughnuts (a special treat he buys once or twice a year from a bakery). And I wrote him a love note, which is always our basic go-to gift. We never had much money when I was growing up, but I still have find memories of my mom making holidays very special for us. She would dye our milk and pancakes green on St. Patrick’s Day. For Valentine’s Day, she bought a small helium tank and put together her own goodies for us. With five kids, that was much more affordable than the florist, and she wanted us to get something from her at school like a lot of our peers did. Looking back, knowing how much effort she put in to making us feel special, I appreciate all that so much more. When we first began our debt freedom journey, physical gifts came off the table as an option. We’ve learned to be creative. Gifts of service and time have always been my favorite. We also found creative ways to frugally involve our kids in Valentine’s Day as well. Don’t get me wrong, “things” are nice. But the effort and thought it takes to give a gift of service or time makes them, to me, so much more special. We always save restaurant gift cards we receive as gifts for special occasions like Valentine’s Day. Tonight we are going to the restaurant where we had our rehearsal dinner and I can’t wait! We will be exchanging cards (not gifts) and we always write love notes in the cards. For the first Valentines Day after my husband and I first got married I made his Valentines Day gift by finding various marriage and love quotes all over the internet. I took my favorites and typed them up, with little hearts between each quote, and put them on some nice pink card stock. I then framed them up in a really nice frame I got from Walmart. 7 years later we still have this on our dining room wall, and it’s one of our favorite decorations, next to everything our kids make that we tape up all over the house!